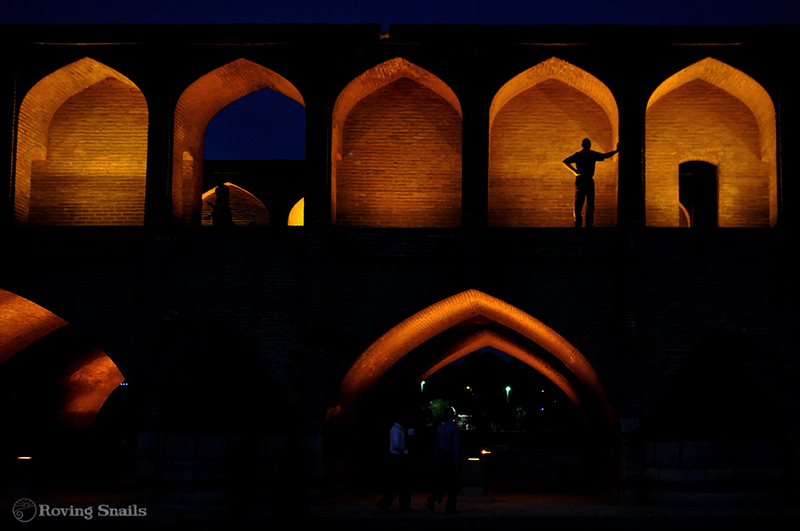 Isfahan feels like a corner of home in between a labyrinth of strange places. It might be its airs of great city, the pride with which it stands like a noble lady with history, someone who knows her well her beauty and the value of her jewells; it might be the distinguished kindness with which it welcomes us, walking into the city through its bulevards. 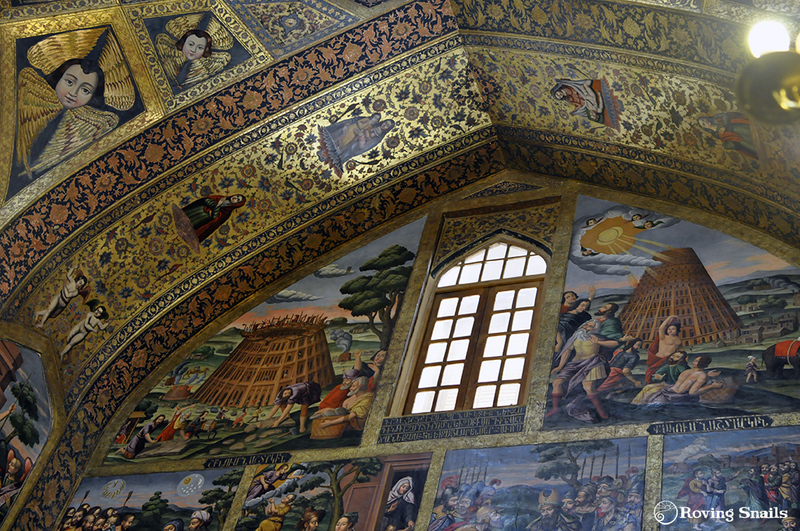 Or it could be Jolfa, the armenian quarter so far from home and so close to Europe, the frescoes with faces climbing up the walls of a church, telling that we can’t easily escape the love for what is familiar, for what we feel as ours. And the cafés, that even to us, who know little of the pleasures of coffee, come to remind how capuccino is a blessing in a land of sweet tea. 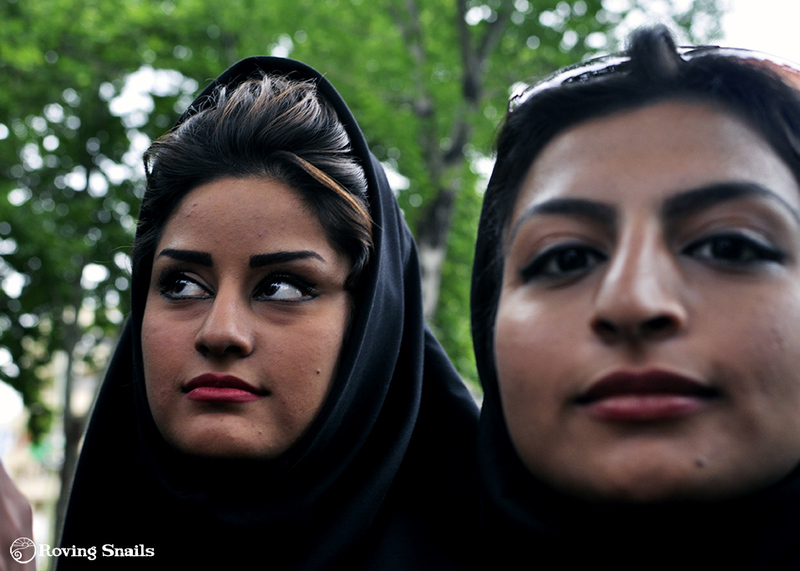 It might be the young couple sitting unusually close by the riverside, or the loose hijabs revealing the city hairstyle fashion, scarves curved to the limits of the law. 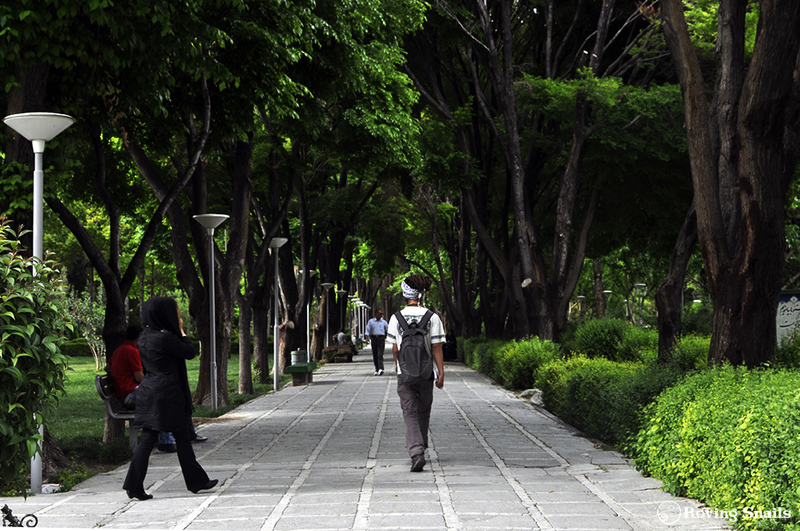 Isfahan is familiar, is green, it invites us to walk. But there are mysteries too, like in all Iranian cities and lifes, smoking pipes hidden in bushes, prohibitions, eyes lurking in the dark, It could not be less in a city where bridges cross a dry river bed, full of people walking them back and forth, as if there was flowing water, invisible to our foreign eyes that so little understand. 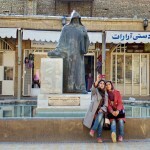 We walk Isfahan, as if moved by currents of air, enjoying the summery feel of icecream in each corner, confusing streets, squares and bridges, getting lost more than we wished and only sometimes finding our ways. Even if we tried to write a walking tour, to collect our memories in an itinerary and label them with pretty letters onto a map, to tell you where to walk, we would fail with all our might. For we wander the city without guidebooks and just open eyes, marking a few landmarks in a map and letting our feet take us wherever they want. 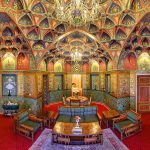 And Isfahan becomes for us a city of details, of fine traces, artisans tinkling music and aesthetics transformed into handicrafts. 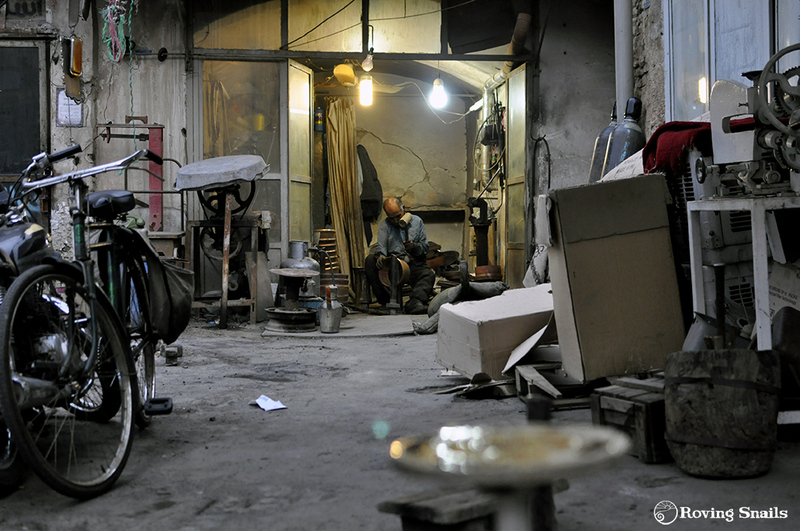 The city leads us through dark corridors, away from the stunning architecture, and into its handmade core. 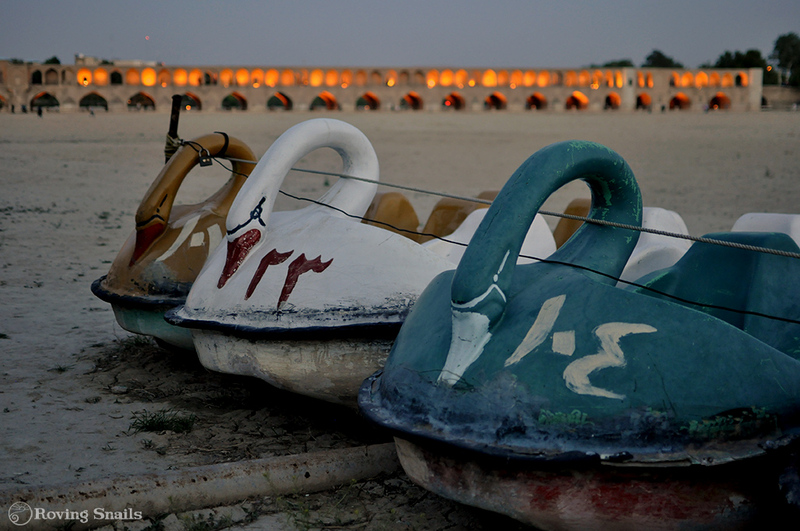 By the time we reach Meidan Emam we are apalled. We can’t believe that a temporary structure is going to spoil all our photographs of the imposing square. 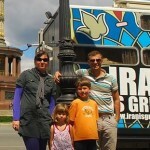 And the people, sociable, interactive, gathered for picnics, request photo after photo with the strangers to the city. Locals turn to tourists while we pose like scultpures on the sidewalk. Excusing ourselves as many times as the custom requests, we slide away into the festival area, decided to find out what has attracted the crowd. Crafts is the answer. 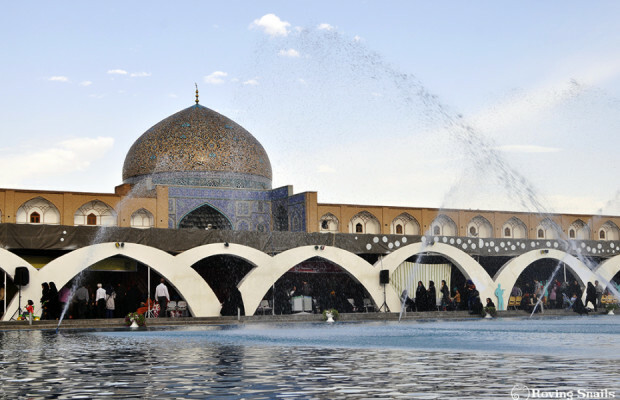 Isfahan celebrates its handmade heritage, and the festival features a selection of artisans, a program of workshops and small exhibitions. 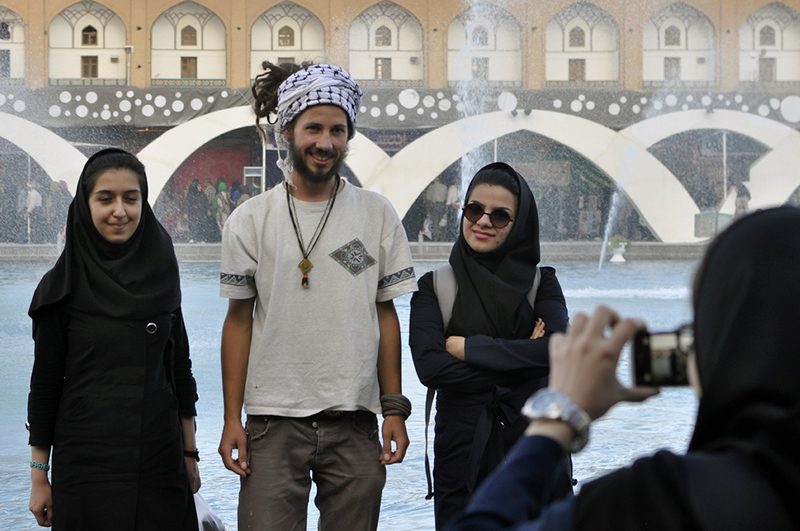 Boris tries his best to stay content in his dismay while I jump around each and every stall, in awe with the spell of luck that had brought me to Esfahan for the best kind of celebration. We try our skills at painting, curious around the work of all artisans, talk to artists, collect business cards, get interviewed by the media, receive gifts, and keep on posing for photographs. 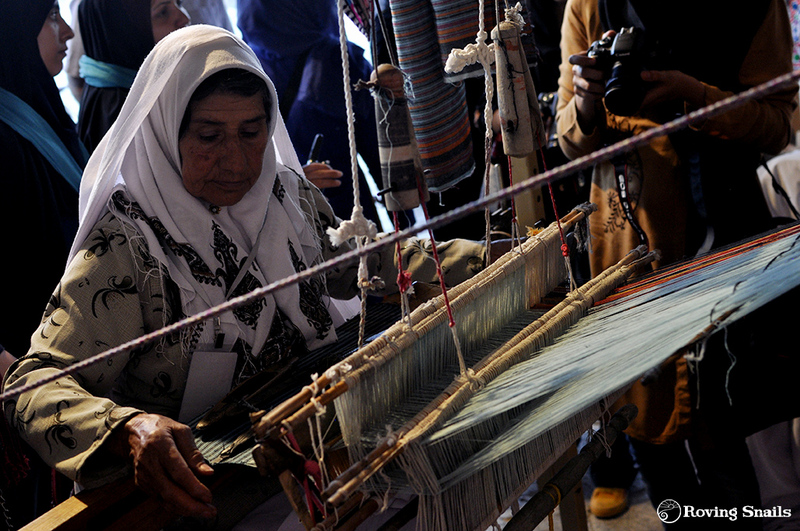 Among a hundred pairs of eyes, a grandmother peacefully weaves colourful scarves. 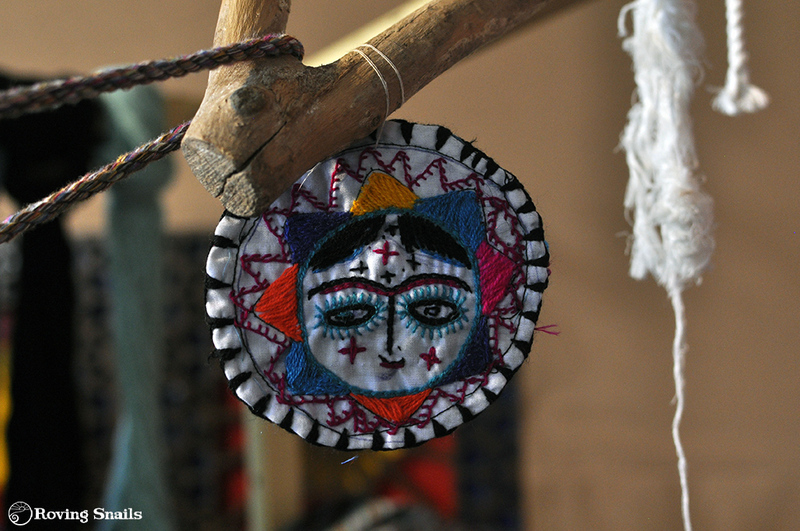 Weaving, the art that joins generations and faraway lands in its neverending threads. There has not been a country so far where we could not find a weaver, sitting by the loom with the very same patience as this lady, watching the cloc-kless time grow in lines. Through a circle of curious visitors, I try to make my way, the most curious of all, as if it was the first time I saw handmade scarves. ‘Very special, very unique’ – random people exclaim in reponse to my interest. They are beautiful indeed, and I would love to buy one for Sve and one for Ala, and maybe even one for myself. Before I can ask for prices, two or three volunteers improvise their interpreting skills, someone else joins with a camera, a few school girls pull Boris away while more people keep gathering around the grandma that once again hides from me behind a coutrain of heads and legs and chadors. Unwilling to get buried under the beauty of the scarves, I decide keep on walking, better search for a quieter place, to maybe enjoy some time and talk with the artisans. We walk out of the crowd and into the historic city bazaar, joined now by Mohammed, who willingly offers himself as translator and guide. 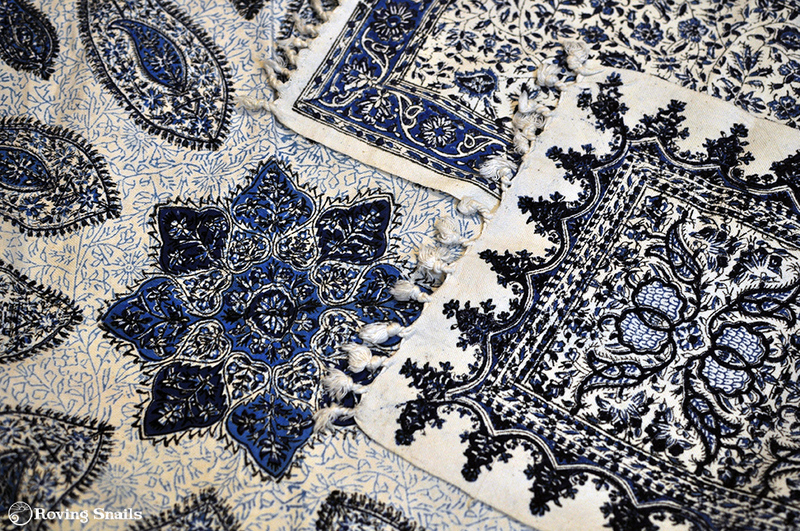 If there is one thing I have come to search in Isfahan is Ghalamkar, the block printed cotton cloth, one the the handicrafts that the city famous for. 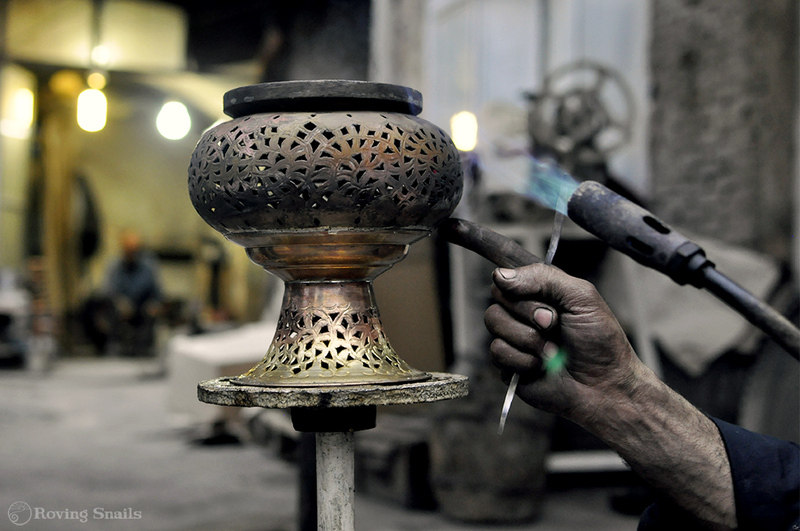 It is the makers of this craft that we want to meet, and Mohammed says he knows them all. We do not walk long. Just a few steps after the first arch we turn into a yard leading to a beautiful shop, where a man prints large table cloths under the scrutinizing gaze of a german team and their dslrs. The shop is loaded like a treasure cave with cotton clothes of all sizes, shapes and patterns, floor to top. I would expect a dragon to be sleeeping in between them, guarding the collection of fine crafts. And indeed there is one, talking some steps away to a young couple, he has not noticed us yet. While waiting for the crowd to disperse, I look around the place like a little girl in a candy store. 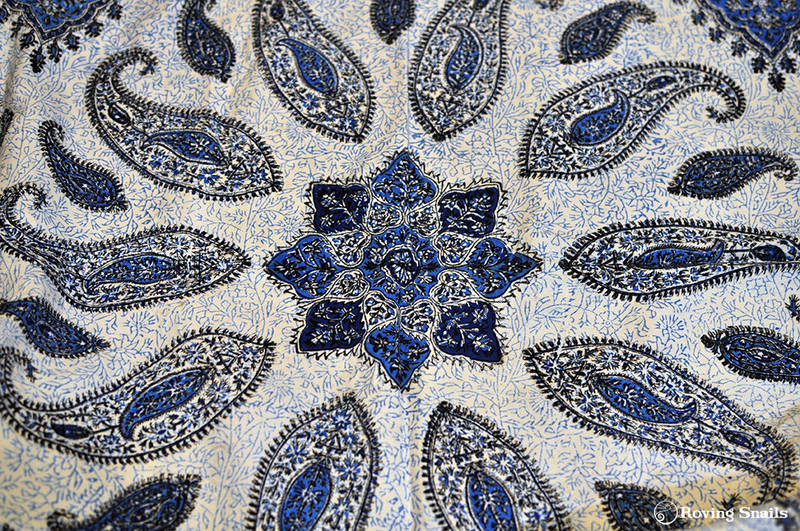 Everything is pretty, flowers, figures, patters and script decorating the fabrics in shades of blue. I want them all, but I will have to choose just some pieces, and unfortunatelly will keep none. 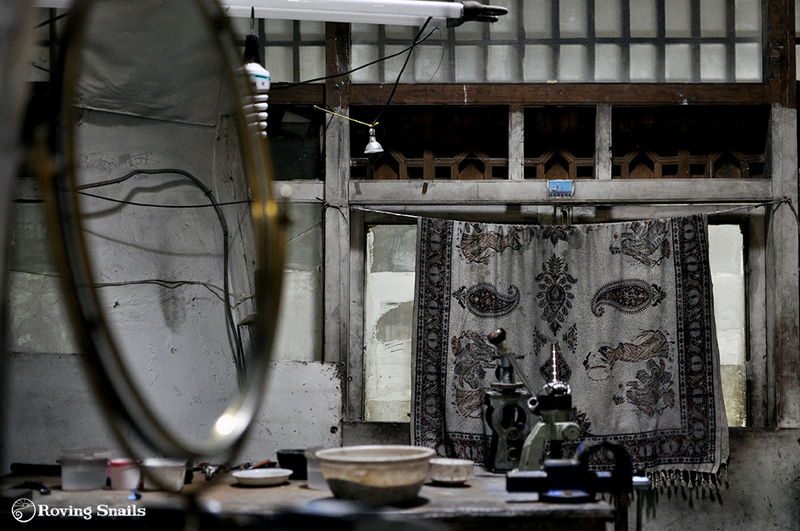 My quest, an living map to handmade Asia, is a treasure hunt for somebody else. “What size are you looking for, Madam?” – The dragon approaches. “Well…something small, a few pieces that I can send by post”. I try to explain my project, while carefully looking for the nicest tablecloth. “They are all nice” – he exclaims with rutinary indiference. 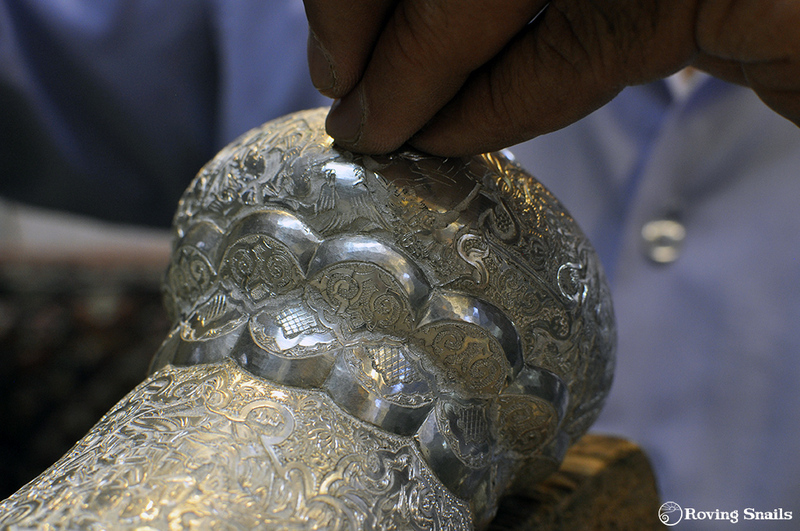 I know, I know that artisan’s shops are like museums, even walking through them is a pleasure to the eyes. Flowers, figures, patterns, shall I choose them all blue, or pick something red too? “No need to see them so close – he appears once again from behind a shelf – just pick any of them, since you anyway want just something small”. A waste of time, this is what my search is for this man, he has better customers to attend, probably wealthier ones. And a rush of blood runs straight into my eyes, and looking firmly into the dragon I only get to exclaim that he will probably never understand the respect I have for each single meter of handmade stuff, and that if he is so annoyed with my joyful walk among his stacks, I can only feel pitty for the poor artisan standing like a puppet among the tourists printing meters of fabric that nobody will look at. As for him, trader without charm, he can sell his big pieces to whoever he wants. 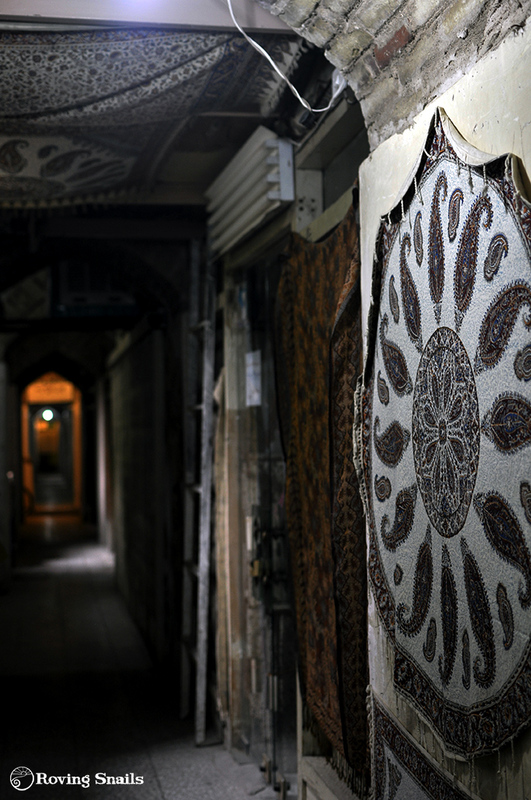 With the help of a note in farsi and our improvised translator following my annoyed pace, we make our way through alleys, patios and staircases into the back streets of the bazaar. 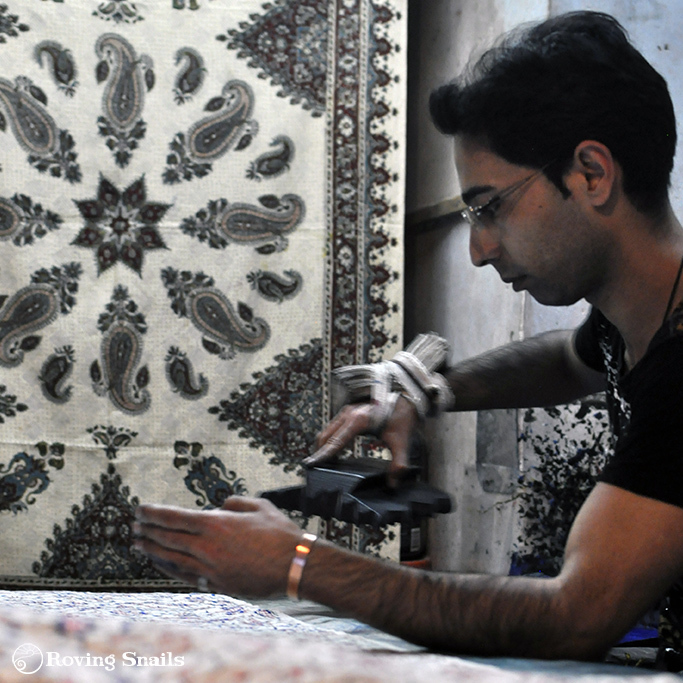 There are carpenters, etchers and engravers, fabric weavers, vase makers. 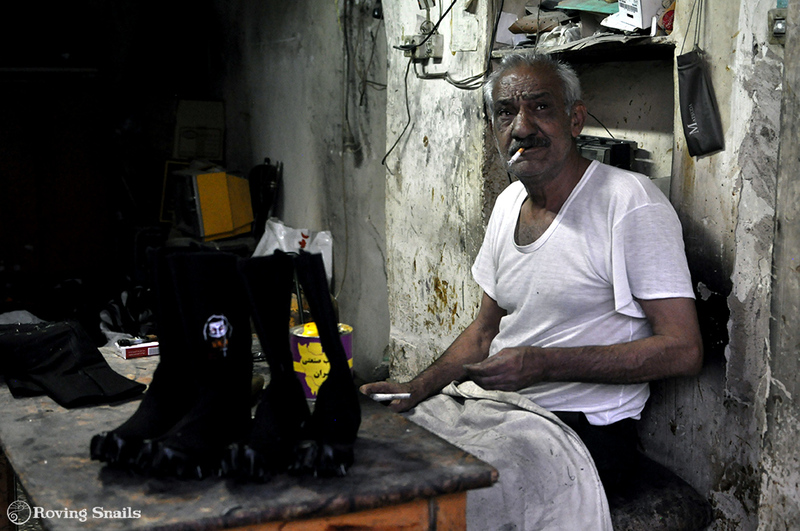 An old man in a dark and narrow hole, sticking soles to boots with viscous glue, lights up his cigatette to pose for a photograph, and I wish I needed new shoes. The tinkling sound of copper makers makes my feet dance along the dark ways. 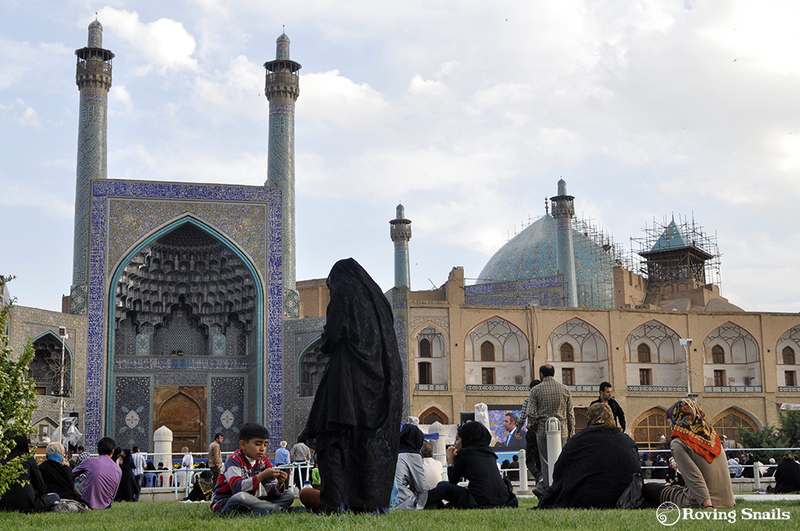 I miss the sunset over the city, the last sunrays on the blue domes of Jameh Mosque and Sheikh Lotfollah. And Boris, feeling that this time the hunt has gone too far, decides to take a rest and a book, heading back to the crowded gardens of Nagsh-i Jahan. A hand drawn map, made by someone who knows someone that may be who I look for, leads to a large yard, and through tiny stairs into a shabby construction on a top floor, above the shops, where Kirus moves rythmically over a never ending cloth. Quietly, all darkness around, I sneak through the door, unsure if I should dare interrupting his work. “I understand – says Kirus in a peaceful voice– You would like to buy the bread from the baker and not from the super market“. I smile, happy that my quest is finally understood. 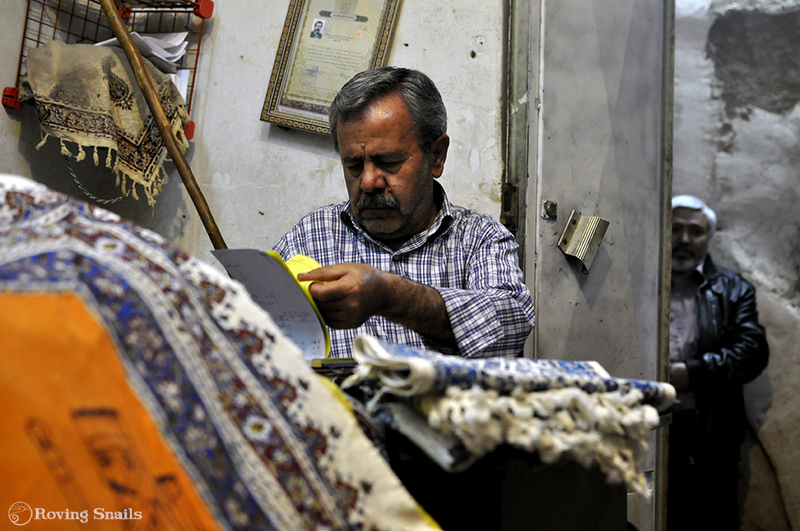 He talks while he works, and carefully explains that that it takes him one hour to make 6 meters of ghalamkar (printed cloth) become a finished work to sell. 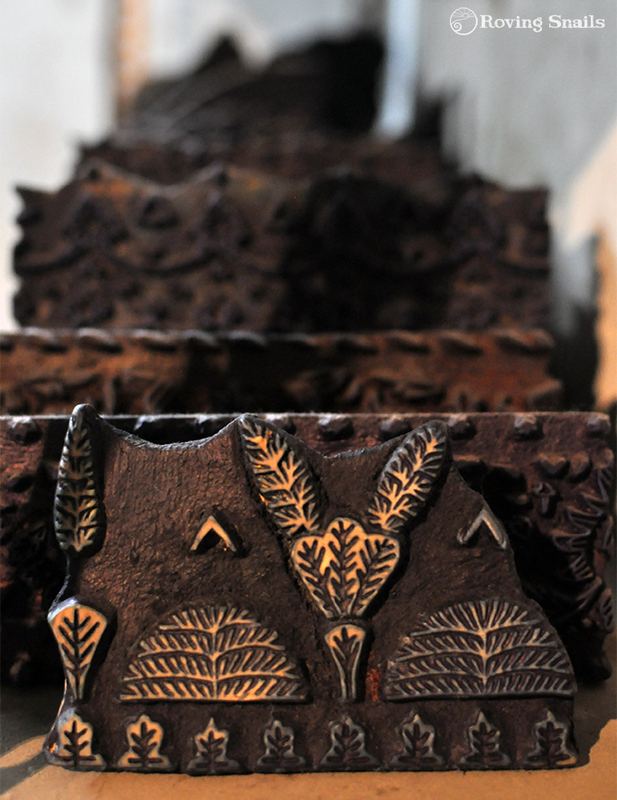 Ghalamkar, Kalamkar, Walamkar…meaning the art of ink and pen, is just an old name for the clothprinthing technique that nowadays is made with woodblok designs. Four colours, indigo blue the most popular of all, but often combined with red, black and yellow, are printed in sequence one over the other. 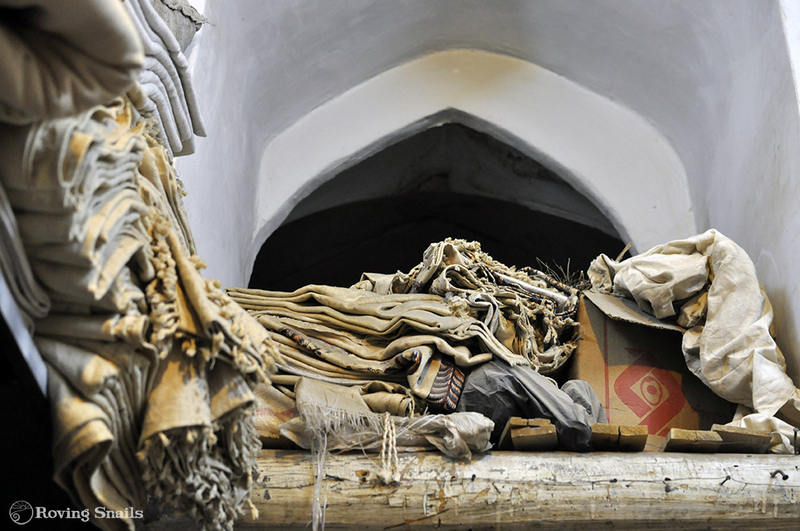 The inks, traditionally natural dyes, are now often mixed or substituted by synthetics “Don’t trust the guys down there, in the bazaar, telling that the yellow comes from saffron. If it were true, they would never sell you a piece at an affordable price”. Each design is made on a number of carved wooden blocks, that create repetitive patterns to be printed in series, like a puzzle, over large pieces of cotton cloth. He did not carve the wooden frames, they are the work of someone else, one more artisan in the chain. And once the cloth is printed, stamping the blocks from 500 to 3000 times, depending on the details of the work, it needs to be steamed, washed, boiled with colour fixers and washed once again. “All the work used to be done by the river, but not so often anymore” – chemical dyes pollute the waters, and it is simpler to send the cloth to other workshops that take care of the washing job. Kirus has spent more than ten years printing patterns for over ten hours a day, six days a week, stamping piece by piece with certainty and strength. I wonder how much his arm must hurt at the end of the day, he says it takes just few months to get used to the pain. And he loves his work, he prints with joy. Following the local tradition, he did not go to any polythecnic school, but learnt the craft from his master Mr Zabolian, who still gives his name to the workhop, who now prefers to sit in the room next door, counting orders and invoices, among hills of white and printed cloth. I have finally reached a treasure cave where no dragon guards the riches. While Kirus finishes his daily chores and Mr. Zabolian dispatches some customers, I am welcomed to go through the room, climbing up and down at will, to find some hidden sets of cushion covers and table clothes, wishing that the travel were taking already home, so I could load myself like a camel wrapped in blue cloth. Relieved that my search has finally taken me to the best place of all, I walk back to Boris remembering, telling myself, that no artisan has ever asked me to buy in a rush and leave their shop fast. 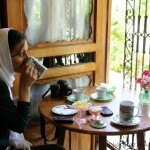 They indulge in explanations, share their stories, the life behind the stuff. For only those who know the time it takes to earn one’s bread, who can tell you how their hands get used to the pain, whose eyes gets tired while pushing for one more meter in the dark, only those who look for the thin balance between the art of precision and the imperfect nature of craft, only they know with certainty that each piece is one, each meter the valuable product of their hands. Please include me in your subscriber list. Thanks. Add me to your subscriber list, Thanks. Disfrutad absolutamente de la página web de Pocoyó participando en los concursos que organizamos.